Hopefully if the one part that broke off takes and grows roots I will have two-for-one! Excellent! Easy 5 Stars! I will buy from this seller again without a doubt. Hardy Planting Zone: Depending on the variety, Irish moss requires USDA plant hardiness zones 4-10 for best growth. This plant prefers to grow in an area with moderate sunlight and doesn't do well in places that are entirely shaded. Ample amounts of both sun and shade are recommended. Mature Height: This easy to care for plant grows to less than 2 inches in height. Soil Conditions: This plant requires normal soil conditions but would do well in soil that is either sandy or clay based as well. It needs moderate rainfall and does not respond well to drought or extremely wet conditions. Irish moss should frequently be watered without overwatering. Overwatered plants will rot, and under-watered plants will brown and die. Growing Speed: Irish moss reaches it's mature height at a moderate pace and can take years to cover larger areas when planted by seed entirely. Transplanted patches will spread at an average rate. Characteristics: It forms tiny white blooms during Late Spring, Early Summer, Mid Summer, and Late Summer. This plant is considered evergreen and is deer resistant.\Uses In Landscaping: Irish moss can be used as a ground cover that doesn't require mowing in areas of moderate foot traffic. It is suitable for edging, filling in spaces between concrete and rocks, and in decorative planters. It is dark green and grows in dense patches. 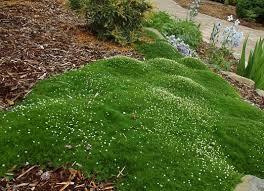 From early Spring to late Summer, Irish moss forms small white flowers that cover most of the plant. The flowers are entirely white and feature five petals around a light green center. The plant is composed of clumps of close-packed blades that grow up to 2 inches in height and completely cover the ground. 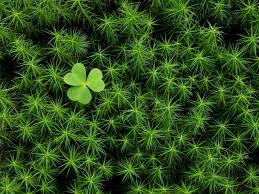 Irish Moss is also known as Scot's moss and is a member of the Caryophyllaceae family. This plant is not a pure moss and is either a herbaceous perennial or evergreen, depending on where it is growing. This plant produces lush emerald green foliage and is dotted with tiny white blooms. For best results, plant it in the late spring when the potential for frost has passed. To provide ample room for the spread, it is best to space these plants 12 inches apart. Irish moss needs moist soil to thrive, avoid soggy soil or over-watering to prevent root rot. It tolerates foot traffic well and has a moderate growth rate. Home gardeners who are looking for an attractive ground cover would do well to consider this herbaceous perennial for their landscape setting. 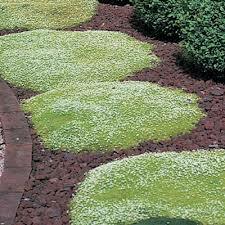 Irish Moss spreads nicely around pavers and flower beds. It is also lovely when grown as a container plant and placed around porches or decks. Because this hardy plant is deer and wildlife resistant, this evergreen looks well kept and neat as a ground cover. It has a relatively low heat tolerance, making it best suited to areas of partial shade. 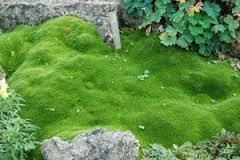 Moss has many different uses in and around the home landscape setting. It is relatively easy to maintain and does not require mowing in most growing areas. Home gardeners often find moss plants a good way to add a pop of deep, emerald green to their garden while filling in flower beds. Because it is easy to maintain, gardeners can sit back and enjoy this nice addition to their yard or home garden.